This article was originally published by 38 North on 13 November, 2014. Uganda and North Korea are two countries which few would immediately identify as natural partners. Yet on October 29, 2014, Kim Yong Nam, Chairman of the Presidium of the DPRK’s Supreme People’s Assembly, arrived in Kampala to a hero’s welcome. Over four days, Kim met with the Ugandan President, Prime Minister and Foreign Affairs Minister amongst others, and had a state banquet thrown in his honor. Kim’s visit comes as part of a longer African tour to the handful of countries on the continent where the DPRK still has a noteworthy foothold. Many of them are known or suspected to be long-time military customers, and bolstering ties will have been on the agenda for each stop. The reported purpose of the Uganda visit was to enhance security cooperation specifically. As noted by Ugandan President Yoweri Museveni, bilateral relations in this area have spanned decades. Military training and weapons transfers were facilitated by Pyongyang during the Cold War. Today, Kampala has made a conscious effort to publicly discuss the more benign nature of cooperation with Pyongyang, making sure to add that, while it has nothing to hide, Uganda’s foreign relations are no one’s business. Venturing close to the grey areas of sanctions-relevant activity, DPRK-Uganda cooperation nevertheless merits further scrutiny. Uganda formed part of a broader African travel itinerary for Kim Yong Nam. The other destinations for the delegation were Ethiopia, Sudan and the Republic of Congo. Like Uganda, they have all had relations with North Korea for some time, including security relations. Cementing and expanding these historical links was seemingly the order of the day, and predictable given the priority the DPRK ascribes to maintaining its few remaining friends. As the requests issued by the North Korean delegation to Uganda demonstrate, winning political support from these governments is still deemed important. The North Korean Vice Foreign Minister allegedly urged Kampala to oppose an expected resolution in the United Nations General Assembly condemning the DPRK’s human rights record, for example. “I will advise [the President] that we should stand by our friends. We have always stood by our friends in the region on ICC. Go back with assurance that we shall stand by you,” promised the Ugandan Foreign Minister. Importantly, these and other long-standing African partners—including Angola, Zimbabwe and Eritrea—are also indispensable markets for North Korean goods and services, whether statues or weapons. Pyongyang’s historical bonds with these governments are still leveraged to generate needed foreign currency. More difficult to divine is Uganda’s interest in courting Pyongyang’s assistance. Why invite North Korea to train Ugandan police in martial arts or riot control? Why ask for its help in the area of health, given the dire state of the conditions in that sector in North Korea? And in light of the strangeness of this marriage, can we be confident that police training or health collaboration are as far as things go? For the Uganda-DPRK relationship, security cooperation has been at the heart of the bilateral friendship. Until at least 2004, ties in the security field involved regular military training for the Ugandan armed forces, some weapons transfers, weapons repair services and perhaps even North Korean assistance in the establishment and operation of a small arms factory. During the Cold War, the DPRK-Uganda relationship not only survived multiple bloody power changes in Kampala, but seemed to be perpetuated by them. 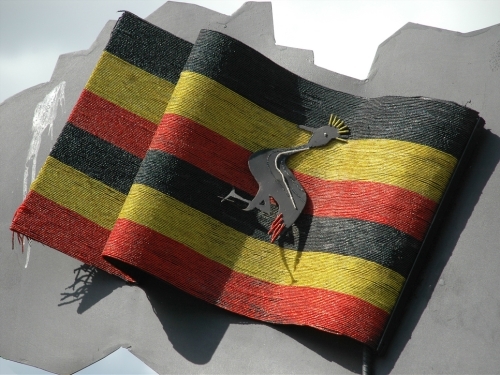 Having attained power through violence and internal divisions, each new Ugandan government remained painfully aware that it too may one day have to defend its position with force. The Idi Amin and Milton Obote governments both arranged for Ugandan forces to be trained by North Korea. After the latter’s trip to Pyongyang in 1981, North Korea deployed a team of officers to coordinate equipment maintenance and infantry training in Gulu. A Library of Congress study asserts that North Koreans even led combat units in operations against anti-government guerrillas around this time. Not long after the current President, Yoweri Museveni, took office in January 1986, he asked DPRK officers to train police forces and National Resistance Army fighters to use the weapons that preceding governments had acquired from Pyongyang. President Museveni ordered new stock as well. A consignment of North Korean weapons, including surface-to-air missiles and rocket launchers, arrived in Tanzania in 1987 destined for onward shipment to Uganda. Further arms transactions took place over the next two years. Recent reflections on past cooperation suggest that North Korean delegations continued to provide police training following the end of the Cold War, as well as instruction for “marine units.” Kampala may have also sought North Korean assistance with the operation of an arms production and repair facility in Nakasongola. It seems widely accepted that China provided assistance with the construction and operation of the factory, which is owned by Luwero Industries Ltd. Some unconfirmed reports, however, point to North Korean involvement as well. Limited evidence is available to support this claim. Discussion forums for Ugandans, for example, reveal complaints dating to 2004 from residents living near the Nakasongola complex. North Koreans reportedly living on Luwero Industries land had been given free rein to fish in nearby lakes, sending the price of certain fish types skyrocketing at local markets. If true, North Korean personnel may have been involved in the day-to-day execution of Luwero Industries business, at least until 2004. The Government of Uganda denied UN inspectors access to the facility until 2007, when it allowed them to view the ammunition production line only. It is thus difficult to verify claims of foreign involvement, and further investigation would be worthwhile. More recently, Uganda has emphasised that its ties to the DPRK are “transparent” and benign, focusing on training and expertise for internal security forces, as well as the provision of “non-lethal” equipment. Training allegedly includes: martial arts, marine rescue, capacity building for the police construction unit, and “security and technical training courses for the Ugandan Police Special Force, Police Construction Unit, Criminal and Forensic Investigation.” No specifics have been offered about the non-lethal equipment. However, in 2013, DPRK People’s Security Minister Ri Song Chol was photographed holding tear-gas guns and canisters which can be presumed to be of some relevance to the DPRK-Uganda relationship. A contract for new police housing units was also signed at that time, apparently because North Korea could build these facilities more quickly and inexpensively than other suppliers. None of this activity directly crosses the boundary into sanctions territory, but does touch on areas where further clarity is needed from the UN Security Council Committee established pursuant to Resolution 1718. Ambiguity primarily stems from diverging interpretations of “arms and related materiel and services.” While the training of Ugandan police in the use of (lethal) arms could be considered sanctions-relevant activity, training police units in taekwondo would not. Similarly, while providing lethal arms would be sanctions-relevant activity (with the exception of small arms, which can be transferred so long as notification is provided in advance to the UN Security Council), providing ‘non-lethal equipment’ would probably not. Official DPRK-Uganda cooperation thus sits close to the defined boundaries of the existing sanctions regime, and closer still to the grey areas where clarification from the 1718 Committee has not yet been forthcoming. That proximity suggests that Uganda is not a case of sanctions ignorance, unlike some governments whose lack of staff and financial resources, and whose national priorities direct their attention elsewhere. Yet official DPRK-Uganda cooperation could be argued to cross a normative boundary. The raison-d’être of UN restrictions on DPRK trade in weapons and military services is to prevent Pyongyang from earning revenue that can be channelled towards its domestic nuclear and missile development. Contracting Korean People’s Army officers to provide training for police or marine units, or asking the DPRK defense industrial machine to produce ‘non-lethal’ internal security equipment, could therefore still undermine the intent behind the UN sanctions regime. At best, what has been disclosed by Uganda represents a welcome effort at transparency: activity that is legal, but could still be argued betrays the intent of UN measures. At worst, its transparency regarding existing cooperation may be in hope of deterring outsiders from probing further into illicit interactions that could lie beneath. Either way, the relationship appears here to stay. In reaction to scrutiny over their dealings with North Korea, Ugandan officials have emphasised that they have a right to engage with whichever country they choose. If that does not indicate the resilience of DPRK-Uganda ties, history should. The security relationship has outlasted numerous changes of power in Uganda, as well as the taboo around security cooperation with North Korea that has accompanied the strengthening of UN sanctions. If past behaviour can serve as a predictor of future behaviour, Uganda’s cooperation with North Korea will continue to warrant questions over its legitimacy and legality. In Christopher W. Hughes, Japan’s Economic Power and Security: Japan and North Korea (Routledge, 1999) 144. “Letter dated 16 July 2007 from the Chairman of the Security Council Committee established pursuant to resolution 1533 (2004) concerning the Democratic Republic of the Congo,” S/2007/423, UN Security Council, (July 18, 2007): 23. “Uganda may be open to MANPADS strategy,” Accessed via Wikileaks, Reference: 07KAMPALA1848, December 6, 2007. “Report of the Panel of Experts established pursuant to Resolution 1874 (2009),” S/2014/147, United Nations Security Council (March 6, 2014): 37. Andrea Berger is a Research Fellow at the Royal United Services Institute for Defence and Security Studies (RUSI), where she focuses on non-proliferation and Korean peninsula security issues.